My name is Kim Detmers and I live in a small city in Southern NM called Alamogordo. I am originally from SLC Utah and lived there my entire life until 4 yrs ago when we moved down here for my husbands job. I have been married to my guy for 26 yrs and we have 3 daughters. I don’t really like the desert due to the “creepy crawlies” down here but I cannot argue that NM has the most gorgeous sunsets I have ever seen. I have been doing some type of art my whole life. Painting, drawing, custom embroidery, dancing, beading and now clay. It always starts as a hobby and kind of evolves into a job but I have a hard time of thinking of it as work because I love it so much! I have been selling my artwork since I was 16 yrs old and was commissioned to paint a mural in my neighbors kitchen. I was doing band logos and drawing and painting and that evolved into painting murals and “faux” finishing in homes and businesses in the Salt Lake area. After I had my oldest daughter it got harder to be away from home to paint murals and we had decided that I would stay home to raise the kiddos so I started doing beadwork to make a little money while at home. I saw a show on TV where they were using Polymer Clay to make beads and thought that would be fun to try. That was 12 yrs ago and I have not put the pasta machine/clay away since. We were doing art markets and festivals to sell my beads and jewelry and in 2007 I decided to open an Etsy shop so my customers find me when we were not doing any shows. Now, thankfully I am down to one show a year ( they are hard work) and my Etsy shop keeps me busy all year long. Shows are fun but after 20 yrs. it is nice to be able to pick one or two fun ones and enjoy them. My kids have grown up at the art market and they can run my whole booth from setting up the tent to tearing it all down at the end of the day. We like to do the big Renaissance Faire in Las Cruces, NM because we get to dress up in our “garb” and it is a fun weekend. I would have to say that what makes my shop unique is “me.” I am self taught and I use my painting and drawing background as well as all those years of markets and meeting customers and getting feedback as inspiration. I think it shows and brings out my own style. In my 20’s I was in a professional middle east dance troupe for 13 yrs and the bright colors in our costumes and beads was one of my favorite elements of the show. I think that is one of the reason I like to mix such bright colors together. I love color and I am not afraid to use them all. Lol I use Sculpy Premo brand clay and it comes in paint colors so it was a comfortable transition for me. I believe that as an artist we put a little bit of our soul into our creations. It is what makes them “our” creations. Part of your experiences and personality go into the work weather you mean to put them in there or not. It is what makes you unique and therefore your creations are unique in that way. When someone buys one of my doors they get to use it as part of their experience and it evolves into other memories and lives on in that way. It becomes theirs which I find intriguing and I am honored to be part of that connection. It is humbling and inspirational. I give thanks every day for being able to do what I do and meet so many wonderful people along the way. 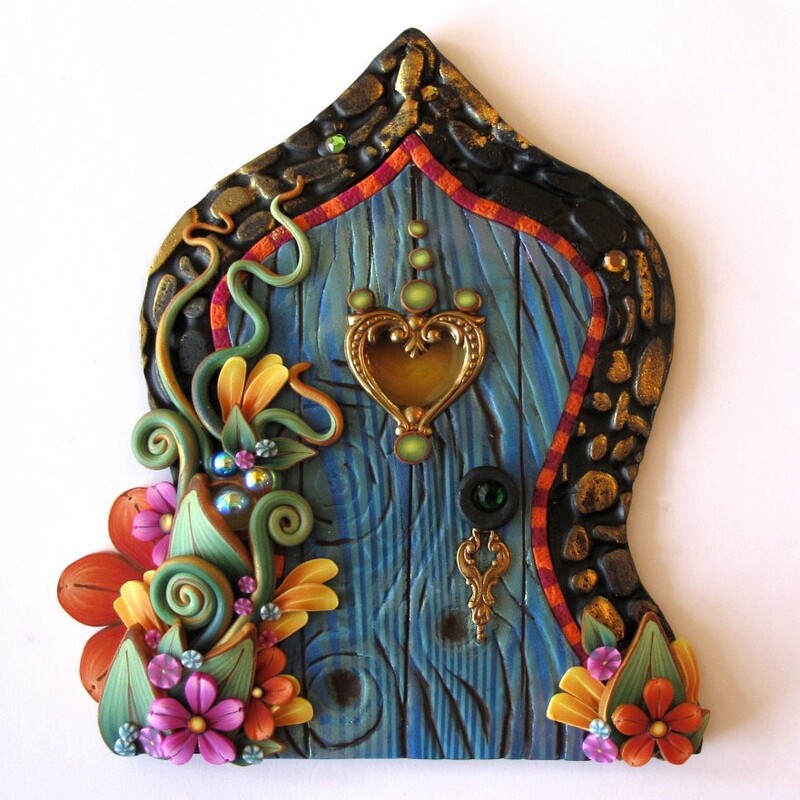 I love making fairy doors. I really get into the zone and kind of disappear into the moment. Each one is a little doorway into my daydream and I think that shows which is again part of the uniqueness. I make the bug pins to face my fear of bugs and for awhile I was making them for an exterminator in FL who would use them as prizes for the exterminator conventions. Funny how you never know who your target market/audience will be. I used to make snakes but I was bitten by a rattlesnake 2 yrs ago and so I have not made any snakes since. Too scary! I do love to make the dragons though ( snakes with wings. haha ) and I like how they each turn out a little differently. I guess I like everything I make. It is too difficult to get good results when making an item your not interested in. I do not use red very often because I do not like the color red and so I never like how they turn out. I know that is not very good business as lots of people love the color red ( my hubby) but I just have an awful time with it. It does look good with turquoise though so if I pair it with another color I can get by. My little boho doors are me reliving those fun filled days in my 20’s without a whole lot of responsibilities, dancing with my troup and friends at festivals and art markets. It reminds me of the spice market with bright silks and the smells of cooking food. Street vendors and artists and all of the colors, smells, sounds rolled in to one little door. I can get lost for hours in one design. I do not like custom orders. I never have. When I was painting murals it was always so stressful to try to get what the customer is seeing into the finished piece. What they envision and what the actual end results can be very different and frustrating for both parties so I avoid the custom order. I do what I call “semi-custom” which they can pick the shape of a door, the colors and a very broad theme or idea. This way I can use the designs I already have made up ( canes, flowers, leaves etc) and I am not spending hours and hours making a door that they may or may not like. I never obligate a purchase because I do not know how it will turn out and I want them to really like it before buying so this method works out well for me. I never plan out my designs and when I make canes it is quite random. I just pick colors I like and start mixing. That way I am not disappointed that it did turn out as planed. I will not put names or anything like that on them because if they do not like it I can then sell it elsewhere. People are always surprised at how fast I can make a door for them but at that point it is just assembling the pieces so it does go very fast. If I had to make a new cane for each design/order I would not make any profit due to time involved so this is a cost effective way to get a good result. Beautiful designs! Love your Bugs! Good luck Kim!